This is plate 33 of Robert Melville Grindlay's 'Scenery, Costumes and Architecture chiefly on the Western Side of India'. Grindlay (1786-1877) was only 17 when he arrived in India in 1803. He served with the Bombay Native Infantry between 1804 and 1820, and during this period he made a large collection of sketches and drawings. 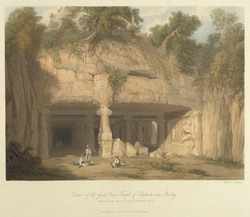 In the year of his arrival, he visited the Elephanta caves. The great rock-cut cave-temple at Elephanta, an island near Bombay, is dedicated to the Hindu god Shiva. Excavated in the 6th Century, it contains some of the greatest masterpieces of Hindu sculpture.